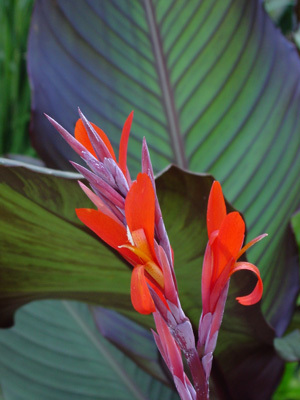 Canna are one of the more commonly found tropical plants. I remember when I was a kid in Indiana, our good neighbor Bea grew them in the summer, then she dug them up and stored them in the warm basement over winter. I grew them in Atlanta, but I never dug them up for winter storage. They seemed to do well in our relatively mild zone 7 winters, dying back to the ground in fall, and then re-emerging in the spring, just like they do here in Florida. They do well in full sun and can grow from 30 inches to eight feet depending on the variety. Propagation is by rhizome division or from seed. 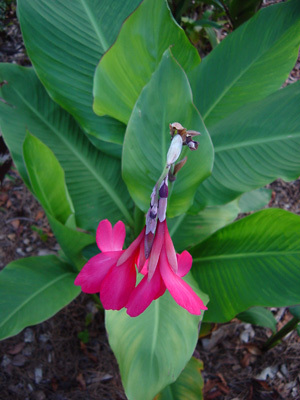 They come in many colors and variations, with large tropical looking leaves on a tall stalk. This plant is native to the tropical new world of Central and South America. They look good planted with bananas, gingers and other similar plants. They sometimes attract the leaf roller worm that eats holes in the leaves and ingeniously stitches the new unfurled leaves so it cannot open.